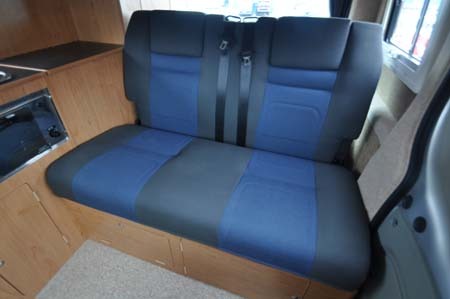 Now here is a camper that you really can use as everyday, the Hillside Leisure Ellastone 2013 campervan – and it comes at a genuinely attractive price. Not that quality has been pared at all. It’s the Ellastone from Hillside Leisure, an independent converter that’s quietly been making quite a name for itself. Be prepared, however, to add some £2005 to that nominal £31,995 starting price. The extra two grand gives you the Sport Pack that encompasses everything from metallic paint to a 115bhp engine upgrade to lots of extra goodies in the cab – think everything from air conditioning to a stereo with steering wheel controls to TomTom satellite navigation. 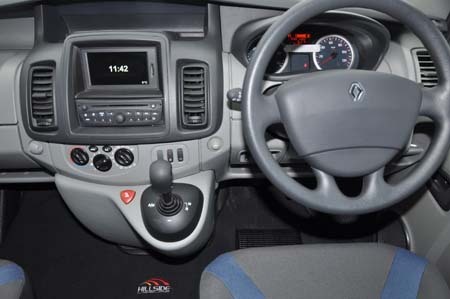 Also proving popular is Renault’s QuickShift robotised semi-automatic transmission, which adds only an extra £800. A smooth enough six-speed manual is the standard offering. Renault’s Trafic tends to stay away from the limelight – possibly because this is a class of campervan that tends to be dominated by Volkswagen’s T5 Transporter; Hillside is an official converter of these, too – but the Renault offers a genuine alternative here. And at prices and specifications that a VW can only dream of. Hillside’s conversion work certainly complements all of this. Build quality is sturdy and there’s an insistence on only using main parts of a proven, superior nature. 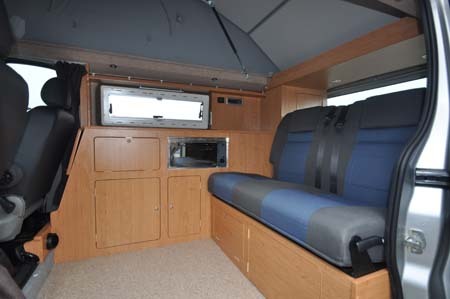 Hence items like the SCA elevating roof, Eberspacher heating and an RIB rear seat. 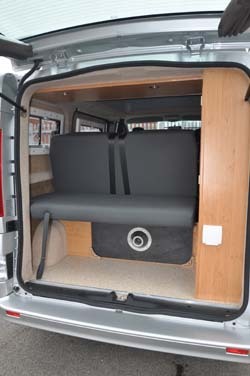 All this and more is part of a conversion that is best described as “VW” (furniture along the one side, that rear seat converting to a double bed). 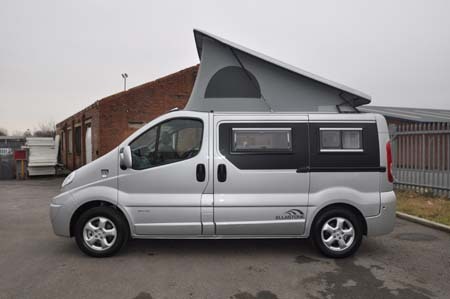 It’s a genuine four-berth – that rear seat is fully safety-tested, there’s another double bed in the canvas-sided elevated roof. 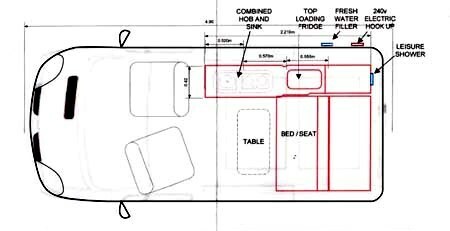 Interior features to look out for include a top-loading, 40-litre compressor fridge (some folk like this lid arrangement, others don’t), a clever kitchen worktop extension section and a pedestal table leg that sits on its own tripod (again, reactions will be mixed). The kitchen is dominated by a combined two-burner hob and sink, supplemented by a grill/oven. 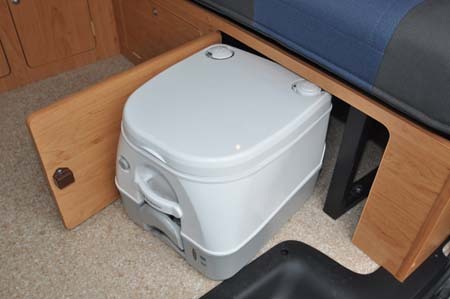 The rest of the unit here is, of course, storage – with Hillside (rightly) opting to provide space for a portable toilet under in the seat base, this leaves space for two large lockers at floor level, another locker beneath the sink, and a handy fiddle rail overhead. That tabletop (it’s not the biggest) stows in the “boot” area located via the rear door (making it a bit inaccessible if there’s luggage here), while its leg fittings go in the wardrobe. It’s really only the Renault’s slightly diminutive dimensions that restrict the bed space. That main double is a slightly restricting 1.79m x 1.20m. Typically, it’s the roof bed that’s the larger of the two – it’s 1.80m x 1.33m – yet you’ll probably prefer the thicker cushioning of the lower deck. The standard specification also extends to a hot water system (devised by Hillside, but working in co-operation with Eberspacher), and double-glazed side windows, LED lighting, and more. It all adds up, of course, which makes the start price here all the more remarkable. Check out the Hillside Leisure website for more information. For more information on our campervan insurance and to get an insurance quote for the Hillside Leisure Ellastone click our link or the get a quote button in our campervan fact file.